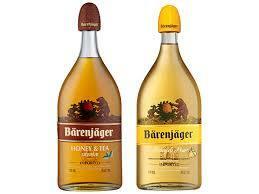 Bärenjäger is a honey-flavored liqueur produced in Germany. It is a blend of vodka, honey from the Yucatan Penninsula in Mexico and other "secret" natural ingredients. This liqueur has a rich history. It developed as a mead-like "moonshine" among the "Bärenjägers," or bear hunters, of medieval Europe. By the 15th century these "meschkinnes" brews were made my many people. It was around the time that Tuecke & Koenig Bear Trap Company introduced the first commercially produced bärenfang, Bärenjäger. The company has been around since and is now owned by Schwarze & Schlichte.